The Man In The High City - We journey to the Golden Age of Greece and learn about the Persian Invasion, the Peloponnesian War, and why contemporary Greek comedians called their leader "Squill-head." The Acropolis (literally “High City”) is the site of the Parthenon—one of the greatest architectural achievements in the history of the world. 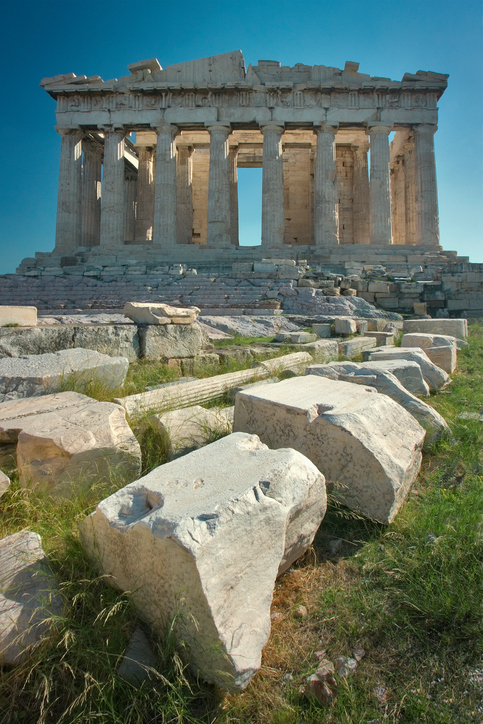 The original archaic temple on the Acropolis was destroyed by the Persians in the sack of Athens in 480 BCE. 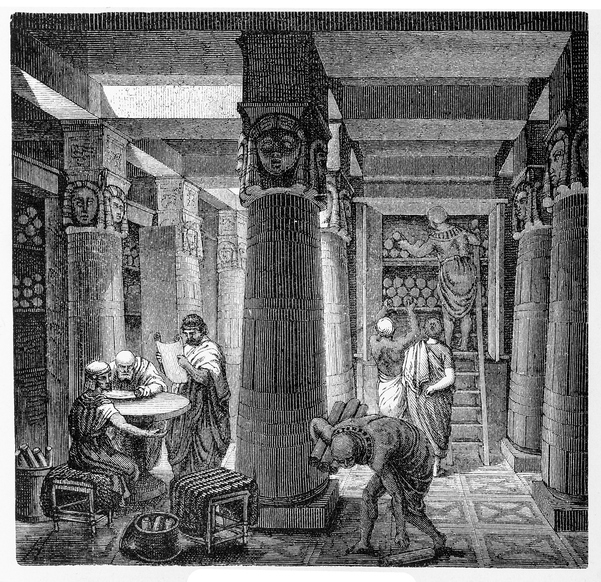 Decades after the defeat of the Persians, the Athenian leader Pericles initiated a rebuilding program (beginning in 447 BCE). 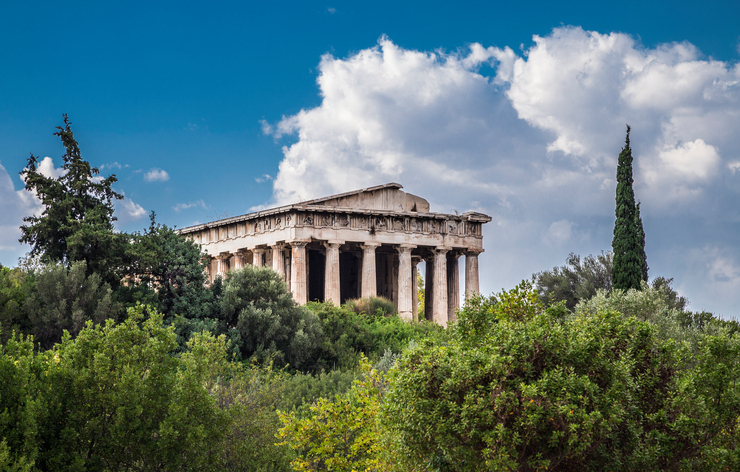 Remarkably, the majority of the Parthenon (a temple dedicated to the goddess Athena) was constructed in a mere 9 years, with the finishing touches completed in 432 BCE. Tragically, it took only a fraction of a second to nearly obliterate it. In 1687 CE, during a Venetian siege of Ottoman-controlled Athens, the Venetians launched a mortar shell at the Acropolis, hitting the gunpowder stores the occupying Turks had been keeping inside the Parthenon. The explosion created the majestic ruins that we see today. Every morning the Greek flag is raised on a pole atop the Acropolis—this stunning monument to human ingenuity and imagination that has survived for nearly 2,500 years. The ancient culture with the broadest and most long-lasting impact on the future of Western civilization was that of Greece. The Greeks dominated the known world militarily for only a brief period, but their cultural influence spread farther and lasted much longer. 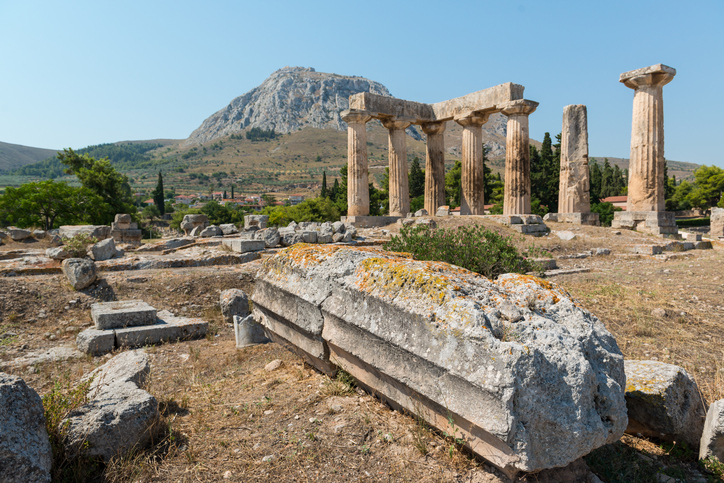 Rediscovered in the West in large part during the Medieval Renaissance, the culture, art, history and learnings of the ancient Greeks formed the foundation for the growth of modern Western civilization. The Mycenaean civilization (c. 1600 – 1200 BCE) was the first advanced culture on the Greek mainland, and from there Greek culture spread to the islands of the Aegean, into the lower Balkans, across the Aegean to the western coast of Anatolia, to Sicily and Italy, to parts of North Africa, and to southern France (Marseilles was a colony of the Greek city-state of Phocaea). 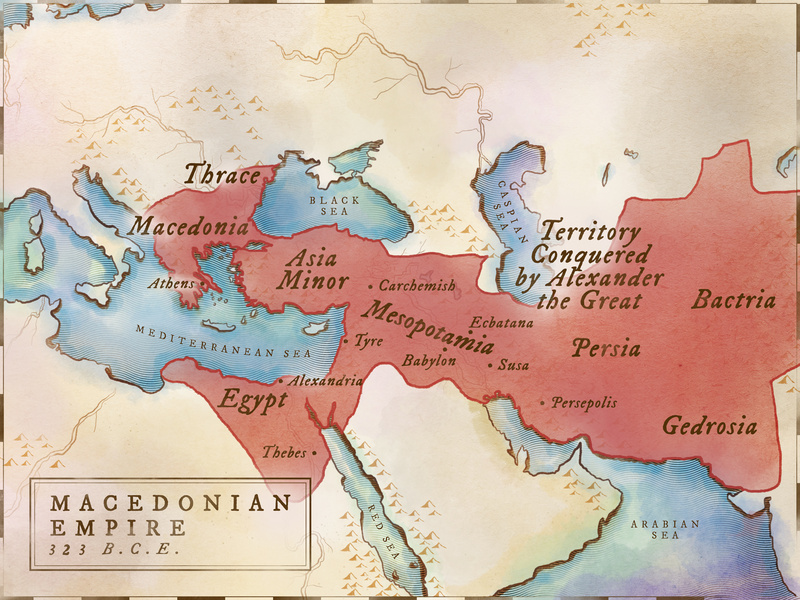 The campaigns of Alexander of Macedon greatly expanded Greek culture, establishing it in central Anatolia, the Levant, Egypt, Syria, Mesopotamia, and Persia to the borders of India. In the early second century BCE, it was possible to travel from the south of modern France to India using only Greek to communicate. Existing as a collection of city-states, there was no specific capital of the various ancient Greek cultures, although certain city-states held dominant positions during different eras. In the Bronze Age, Mycenae (located in the Argolid plain of the Peloponnese) was one of the strongest and richest citadels. 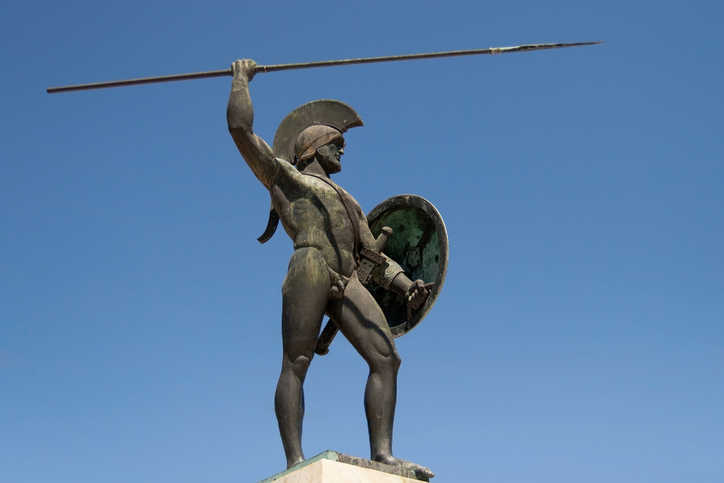 During the Archaic and Classical periods, Athens (the cultural center and strongest sea power) and Sparta (the strongest military power on land) vied for prominence. During the brief Greek apogee under Philip and Alexander, the de facto capital was the Macedonian city of Pydna. Following the death of Alexander, his empire was eventually divided into three parts. The Antigonid Dynasty ruled Greece and Macedonia from Pella. 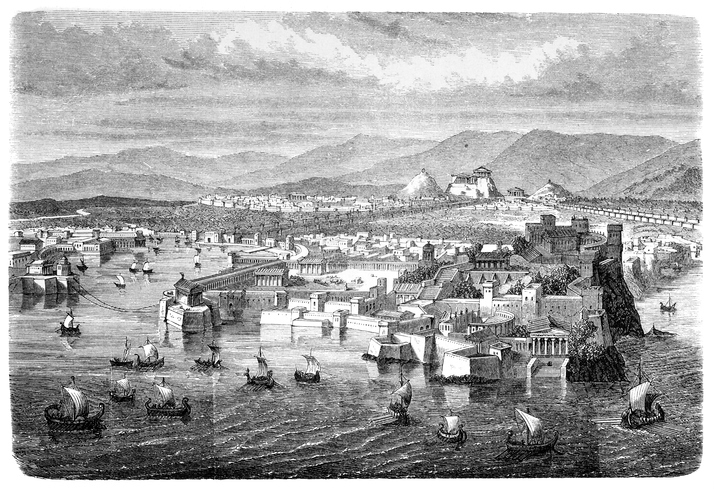 The Seleucids ruled Mesopotamia, Anatolia, Syria, the Levant, and Persia from a newly built city, Seleucia, on the Tigris River. The Ptolemaic Dynasty ruled Egypt from another newly built city, Alexandria. Here the former Macedonian general Ptolemy I Soter built the legendary Library of Alexandria—a repository for tens of thousands of scrolls. The history of ancient Greek culture is divided into several periods—the Bronze Age (2100 to 1200 BCE), the Dark Age (1200 to 800 BCE), the Archaic Period (800 to 500 BCE), the Classical Age (500 to 336 BCE), and the Hellenistic Period (336 to 30 BCE). The Bronze Age saw the rise of the first cities on the mainland. These were predominantly fortified palaces on hilltops. 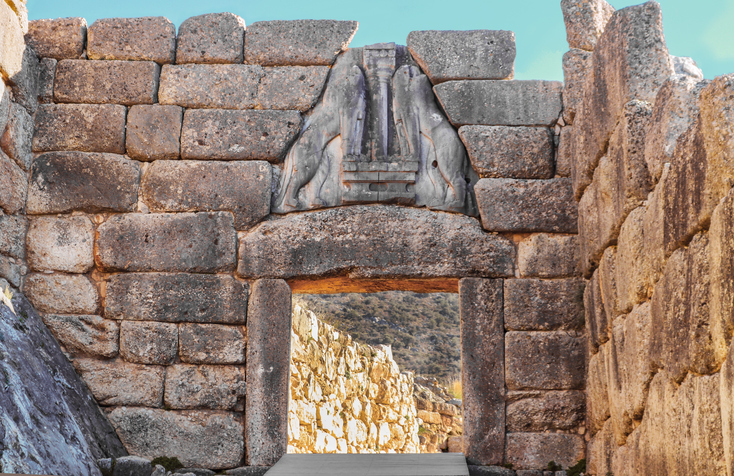 This culture was named after its greatest citadel, Mycenae. The Mycenaean culture disappeared around 1200 BCE because of outside invasions. 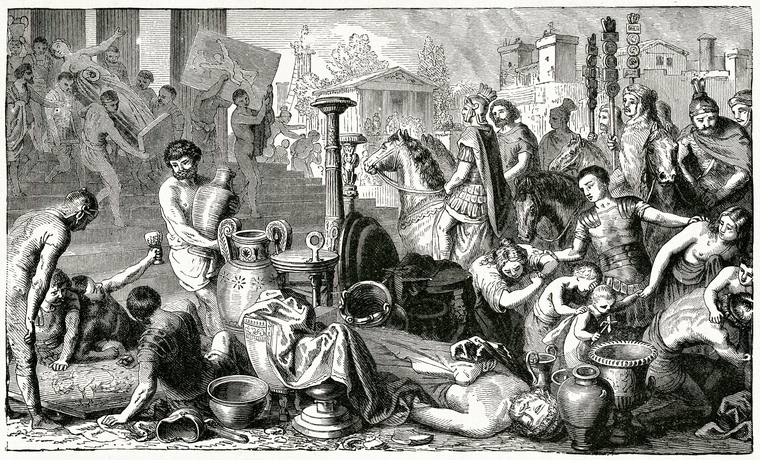 The city of Troy was also sacked around this time. 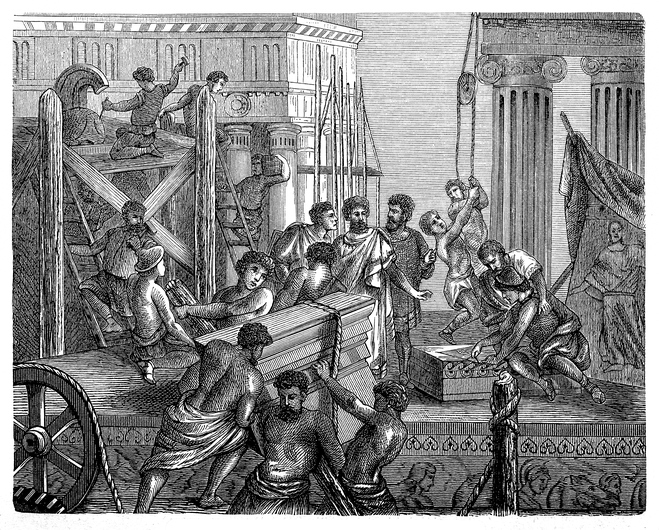 The catastrophe of 1200 BCE (described above) devastated the economy of Greece and ushered in a Dark Age that lasted about 400 years. 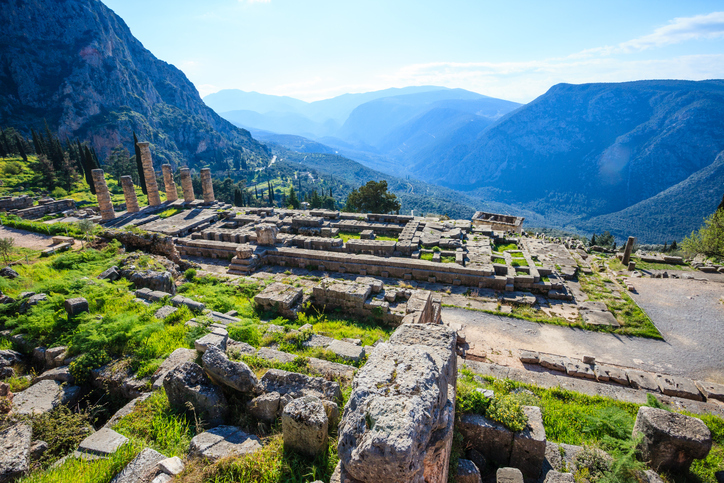 Civilization gradually reappeared at old sites, such as Athens, and at new sites, such as Sparta and Corinth. By 800 BCE the city-states of the mainland were economic and military powers. During the next 300 years, the Archaic Period, the Greeks expanded by establishing colonies across the Aegean in Anatolia (Ionia) and along the central and western Mediterranean coasts. The Archaic Period came to an end when the rising eastern power of Persia came into conflict with the Greeks over the Anatolian coast. The period of 500 to 336 BCE was the Classical Age of Greece, dominated first by the wars with Persia and then the Peloponnesian War between Athens and Sparta. Although this period is defined by military events, it was also a time of many important cultural advances. The Hellenistic period takes its name from the Greek word Hellene, which means a native of Greece and came from the word for the region of Greece itself: Ἑλλάς (Ellás). The Hellenistic era began with the installation of Alexander as king of Macedon following the assassination of his father. In some 13 years of military campaigns, Alexander conquered most of the known world and spread the Greek culture behind his armies. Grains and bread were staples of the Greek diet, but they could be grown only in a few fertile areas. Most of Greece was hilly and not suitable for large farms on the scale of Egypt or Mesopotamia. Farmers grew fruits and vegetables where they could clear fields. 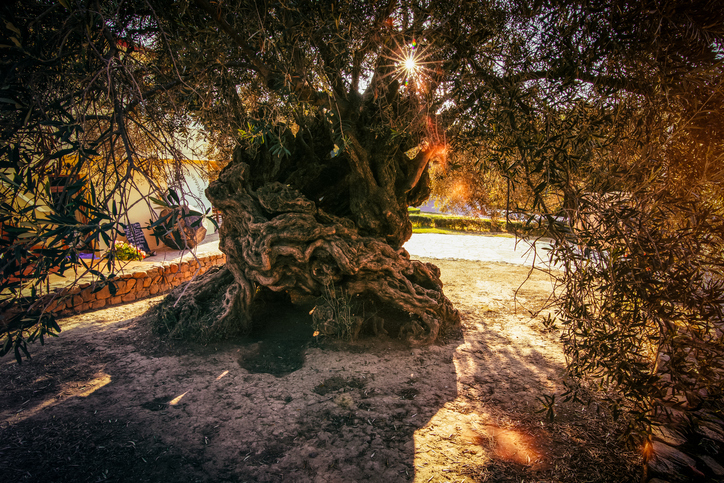 On the hillsides, they tended olives for food and oil; and cultivated grapes for wine. Horses were raised mainly in Thessaly and Macedonia where there were open grasslands. Elsewhere only the rich owned them. Cattle were kept mainly for milk, pigs and poultry for meat, and sheep for leather and meat. Seafood supplemented diets in coastal areas. The Greeks were renowned for pottery that was both functional and beautiful. 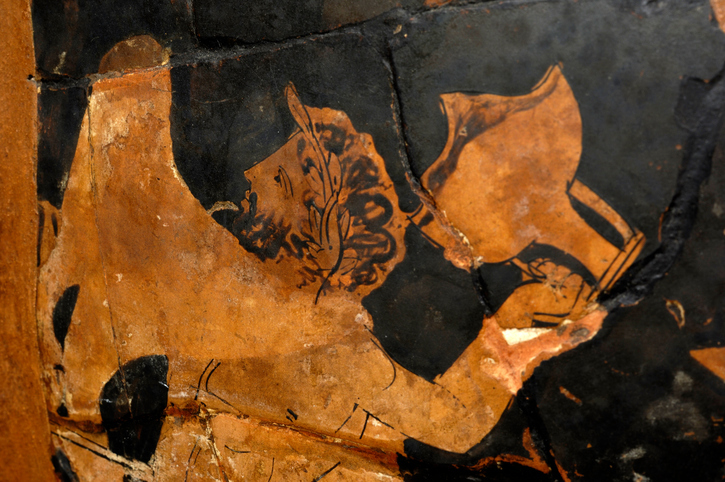 Decorations on pottery revealed much about the ancient Greek culture to historians. 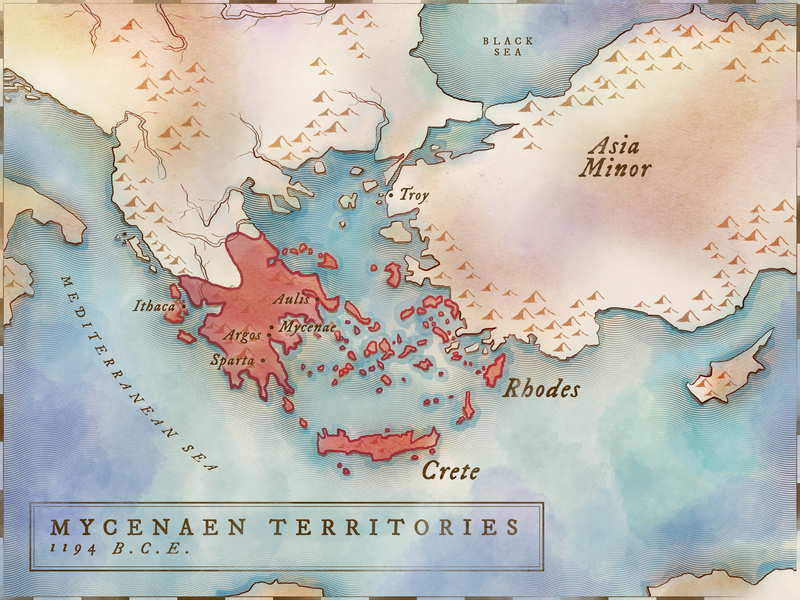 The Greeks took advantage of their geographical position between the Aegean and Mediterranean Seas to engage in trade. City-states traded amongst themselves and overseas. Thessaly and Macedonia exported horses, for example, while Athens exported honey and silver. Coins were first used in Lydia, a small kingdom in northwestern Anatolia, at the end of the seventh century BCE. The concept quickly spread to the Ionian Greek colonies and then throughout the Greek culture. The most popular coins were made of silver. 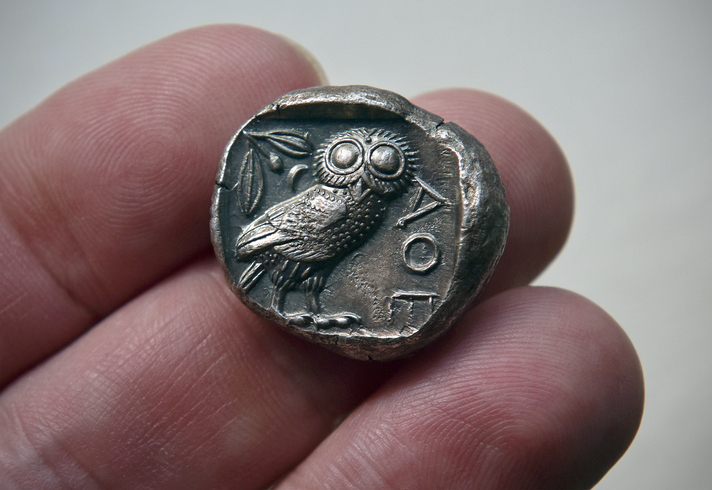 The silver tetradrachm coins of Athens were called glaukes (γλαῦκες) meaning “owls” because they bore an image of the bird that was the symbol of Athena. The Greeks believed in many gods who were responsible for the living and the dead. Their gods were very human—they got married, had children, felt love and jealousy, and sought revenge. Legends of the gods taught people what pleased them and what angered them. The principal gods were the twelve Olympians thought to live on Mount Olympus, led by Zeus, ruler of the heavens. Temples were built to provide earthly homes for individual gods. The Parthenon in Athens, for example, was dedicated to the goddess Athena. Festivals were held to please individual gods and persuade them to be munificent. Before an important project was started, an oracle or soothsayer was consulted to learn the will of the gods. The most famous of these was the Oracle of Delphi, where a priestess called the Pythia would voice the will of Apollo. Priests would interpret the Pythia’s often-vague replies. Music, poetry, and theatre were an important part of Greek culture. Most Greek city-states and their colonies had a theater or amphitheater. Society consisted of two main groups—free people and slaves. Slaves were owned by free people and were employed as servants and laborers. Slaves were purchased in international slave markets or were prisoners of war. Free men in Athens were either citizens, born to Athenian parents, or metics, born outside of Athens. Both groups were required to serve in the army, but only citizens could become government officials or jurors. This bust of the renowned Athenian leader Pericles is from the Vatican Museum’s collection. It is a Roman copy based on a lost Greek original carved by Kresilas, a sculptor who created the monument soon after Pericles’s death from the plague in 429 BCE. In the carving Pericles wears his Corinthian helm pushed to the back of his head in the manner of a strategos (general); but he might have been shown this way to hide is famously elongated and bald cranium (he was nicknamed “Leek-head” by his contemporaries). The inscription reads simply “Pericles, Son of Xanthippus, Athenian.” Without Pericles’s visionary building program the masterpiece of architecture called The Parthenon might never have been built. 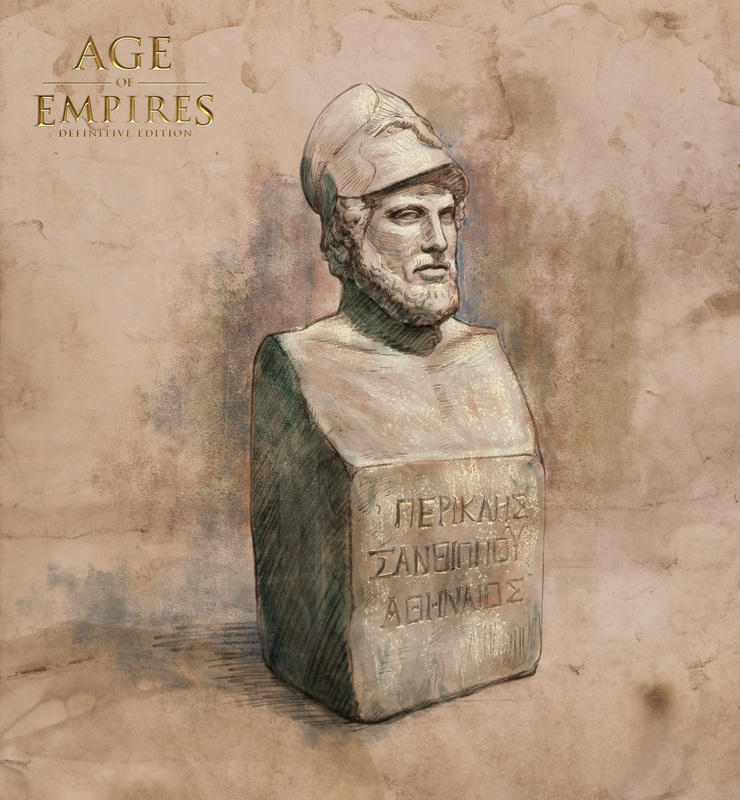 An independent city-state was called a polis, consisting of the city and surrounding countryside. The largest of these was Athens, with about one thousand square miles of territory. During the Archaic Period, most city-states were governed by a group of rich landowners. These were the aristoi, meaning “best people,” or the aristocrats. Resentment of aristocratic rule led to riots when traders and craftsmen began to prosper but had no say in government. 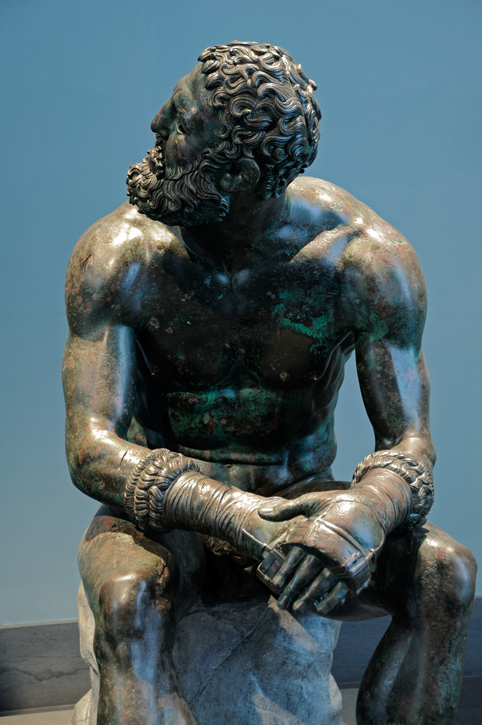 Beginning around 650 BCE, individuals called tyrants were allowed to rule to keep the peace. Government was sometimes improved under an enlightened tyrant; but the system was susceptible to corruption. 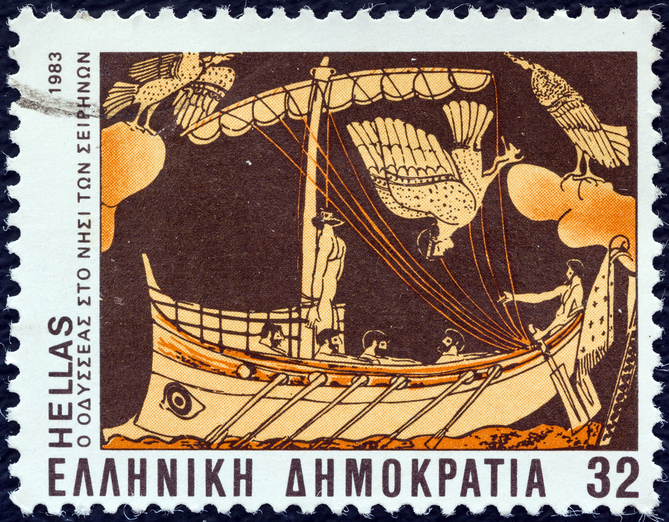 In 508 BCE Athens introduced a new system called democracy, in which all citizen males took part in their government. Women, foreigners, and slaves had no say, however. Interestingly, in the dual-monarchy of Sparta, freeborn women were allowed many more rights than free female Athenians, such as the right to inherit property. One of the most important architectural forms to emerge from ancient Greece is the temple or naos (Ναός) meaning “dwelling of a god.” The earliest temples were simple post-and-lintel designs built from fragile materials such as wood and bricks (like the original temple on the Acropolis that was burned by the Persians in the sack of Athens in 480 BCE). 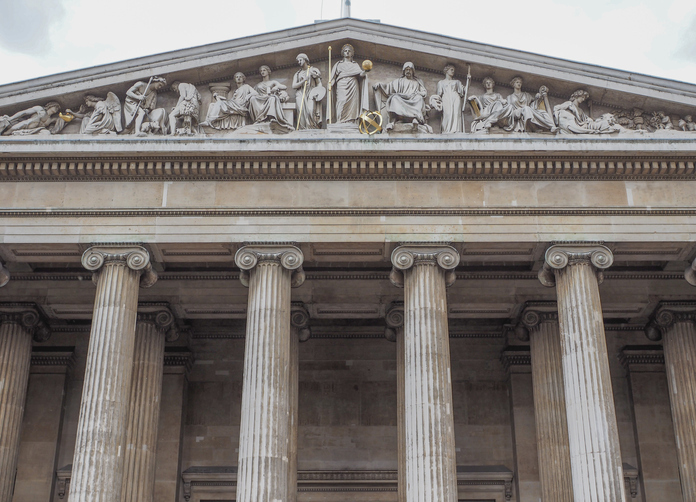 Greek temples evolved into magnificent structures built from elaborately carved stone. The Parthenon in Athens (completed in 432 BCE) is the exemplar of the naos—a combination of Doric and Ionic architectural principles. The temple’s limestone foundations support columns and pediments made of marble quarried from nearby Mount Pentelicus. 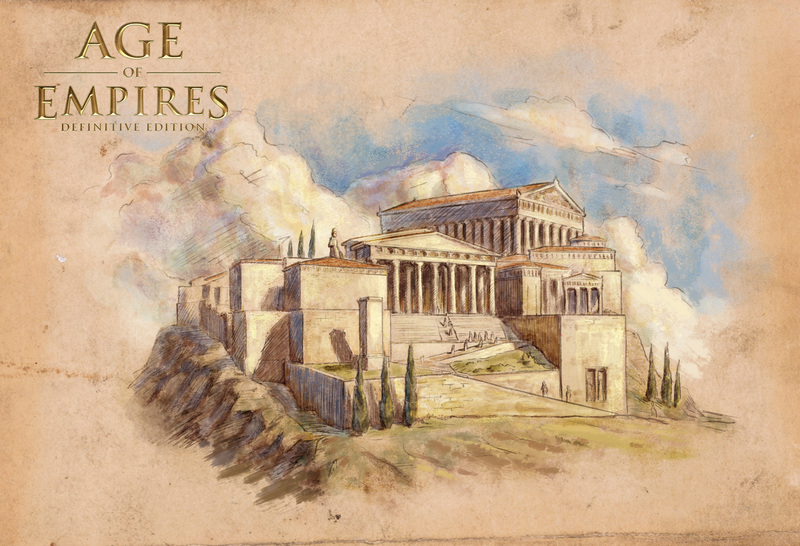 The Parthenon cost 469 Attic talents (over 25,000 pounds of silver) and was supervised by the architect Phidias (the designers were Ictinus and Callicrates). 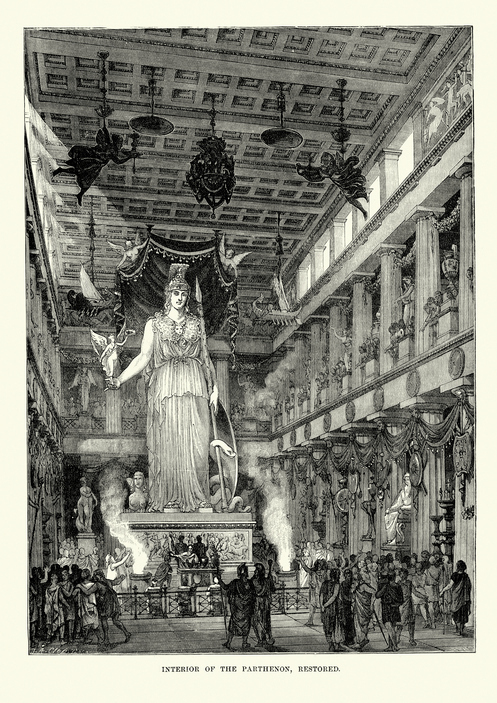 Inside the Parthenon stood an awe-inspiring 40-foot-tall gold and ivory statue of the goddess Athena. The design of Greek theatres is also one of the lasting architectural legacies of this culture. 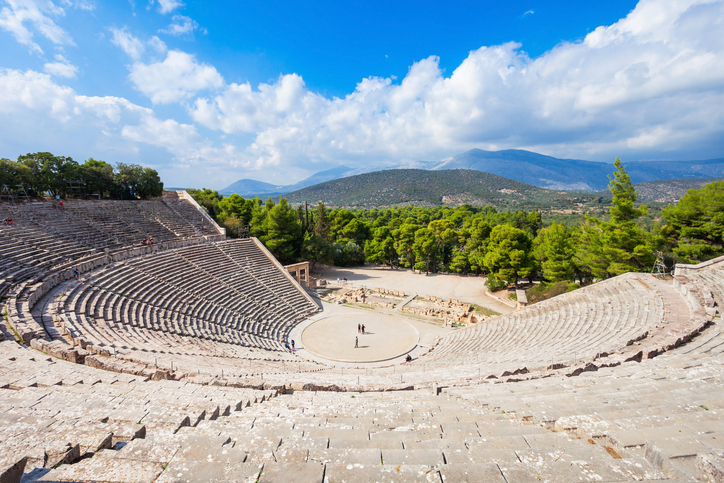 The word theatre comes from the ancient Greek word theatron (θέατρον) meaning “seeing place.” The first theatre-goers in ancient Greece might have sat on a hillside, watching actors below performing on a stage made of trampled earth or a circular threshing floor. These primitive spaces evolved into sophisticated open-air stone auditoriums built into the sides of hills, like the Theatre of Epidaurus (late 4th century BCE) which held up to 14,000 people and, to this day, has nearly perfect acoustic qualities. Greek playwrights of the 5th century, like the genius Euripides, wrote scenes that required the world’s first special effects—cranes that flew actors portraying gods onto the stage to bring about dramatic conclusions to the tales. These machines were later dubbed deus ex machina or “god in the machine” by the Romans. 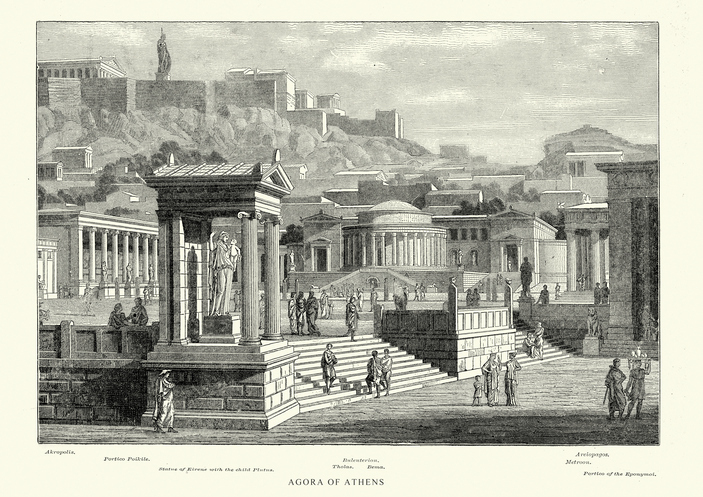 The agora (Αγορά) means “gathering place” and came to symbolize the democratic nature of independent Greek city-states. This centralized and public space was a nexus of activity—an open space where merchants, philosophers, public speakers and artisans all came together in the beating heart of a citadel. Hoplites carried on their left arm a large round shield that extended from neck to thigh. 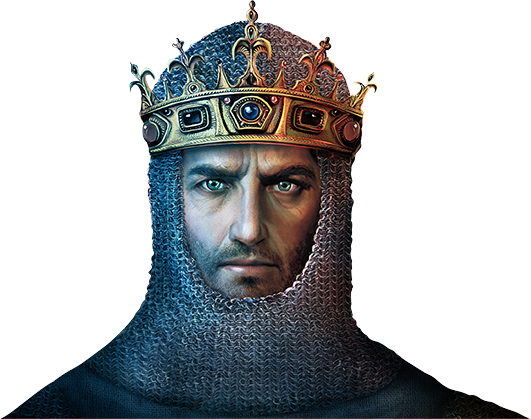 They wore bronze helmets, sometimes with a horsehair crest on top to make the warrior look taller and more powerful. For body protection, they wore a cuirass of bronze, or leather and bronze, from shoulder to chest, plus bronze greaves on the front of the lower legs. Their weapons were a long spear and a short iron sword. 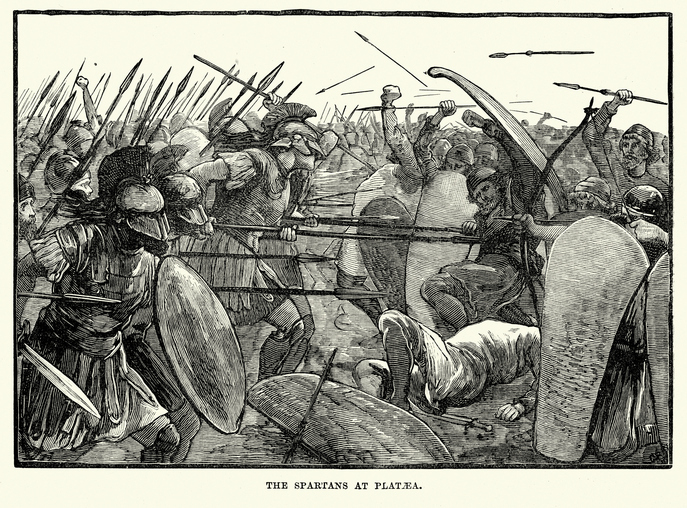 Hoplites fought in the phalanx, a square of men usually eight ranks deep (a number that the Macedonians doubled: see illustration). It was important that the phalanx moved and fought together. Flutes and other musical instruments helped them keep in step. The terrifying hand-to-hand clash of opposing phalanxes called for extreme courage and discipline. 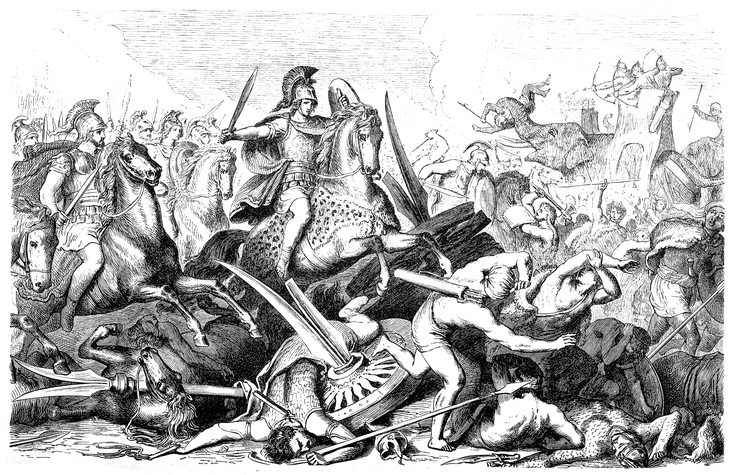 The Greeks disdained the use of cavalry and skirmish troops using bows, slings, or javelins. For as long as they fought among themselves or were lucky, this was not a problem. Extensive contact with other military systems during the Persian Wars eventually convinced them that the phalanx needed to be supported. The ultimate Greek army employed heavy and light cavalry, light infantry, and skirmishers in support of its heavy hoplite infantry. 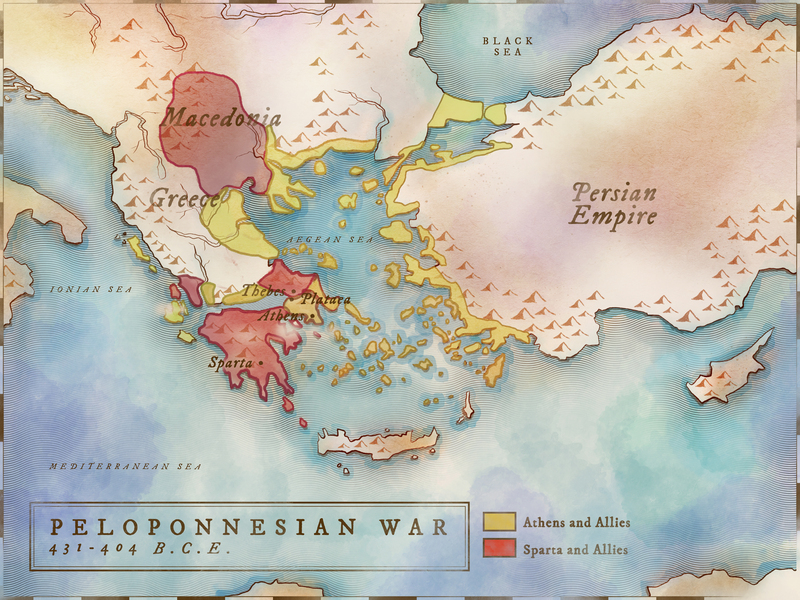 Following the death of Alexander the Great, the city-states of mainland Greece attempted to rebel against Macedonian rule but were defeated in the Lamian War of 323-322 BCE. During the next 40 years, the War of the Diadochi contested the division of Alexander’s empire. It was eventually divided into three kingdoms (Greece, Egypt, and Persia). These three kingdoms made up the Hellenistic world. The Antigonid Dynasty ruled Greece and Macedon but lost control of their colonies in southern Italy to the Romans in 275 BCE. Some Greeks supported the Carthaginians against Rome during the Punic Wars and paid for their allegiance once the Carthaginians were destroyed. Three Macedonian wars against Rome resulted in the end of the Antigonid Dynasty in 168 BCE. Following an unsuccessful Macedonian revolt, the city-states of Greece became provinces of the Roman Empire in 146 BCE. The Seleucid Dynasty attempted to rule what had been the enormous Persian Empire. This proved impossible, and parts of it began rebelling very quickly. By 180 BCE, their kingdom had been halved. In 64 BCE, the Roman general Pompey seized the Seleucid kingdom and incorporated it into the Roman Empire. The Ptolemaic Dynasty consisted only of Egypt. Because of its relative seclusion and wealth, it lasted the longest of the three Hellenistic kingdoms. Queen Cleopatra VII and her husband Marc Antony of Rome were defeated in battle by Octavian (later called Augustus Caesar) at Actium in 31 BCE. In the aftermath, the last Ptolemy committed suicide and Egypt became part of the Roman Empire in 30 BCE. The Greek language and culture spread behind Alexander the Great’s armies. The Romans in turn adopted much of the Greek culture, preserving it and spreading it to new parts of the world. After the fall of Rome, Greek culture was preserved and expanded upon within the Byzantine Empire and in the Islamic Near East, and passed on to the West during the Medieval period. The legacy of ancient Greece has had an impact on many disciplines, including medicine (the scientific approach to healing; the Hippocratic Oath taken by doctors), mathematics (Euclidean geometry; the Pythagorean theorem), literature (the Iliad and the Odyssey), theatre (the plays of Sophocles, Euripides and Aristophanes), poetry, sculpture, language (the Bible’s New Testament was written in Greek; thousands of words passed on to modern languages), architecture (the White House; the British Museum), history (Herodotus is regarded as the father of history), politics (democracy; the judicial system), philosophy (all philosophical studies since Plato have been referred to by one writer as mere footnotes to his work), science (the scientific method; laws of nature; the classification of plants and animals; the heliocentric theory), athletics (the Olympic Games), and trade (Greeks established trade routes to India and the Silk Road to Asia).